Fallacy #1: In simply having shared the ring with Floyd Mayweather Jr. in a losing effort, Saul Alvarez has, through some form of osmosis or telepathy, imbibed and absorbed all of Mayweather’s boxing acumen and ability. This notion is blasphemy. All fights, all sparring sessions, every day of training, and virtually every day of life entails a myriad learning experiences. Undoubtedly, Alvarez has been incrementally improving as a fighter since he emerged onto the world class stage. But, to attribute the quantum leaps that he’s made solely to his thirty-six minutes of glorified sparring spent with Mayweather Jr. is appalling. Alvarez has enhanced himself as a boxer through the same mixture of self-belief, determination, discipline, natural talent, increased experience, and indefatigable dedication that it takes for anyone to improve at anything. Not surprisingly, the fallacious argument tends to emanate from a certain demographic that displays a clearly biased, but criminally obvious, interest in seeing Alvarez flourish in the fight. These are the hordes of Mayweather Jr. sycophants that desperately need Alvarez to win, and to win big, against Golovkin, so that it will raise Floyd’s stock, elevate his legacy, and diffuse any potential public pressure that would subsequently be placed on him to challenge the Kazakh Kayo King. Fallacy #2: Since Golovkin is the puncher, then Alvarez is automatically, the boxer. We live in a media depicted polarized society where labels, categories, and identities are integral elements in trying to make sense out of things. The media and ultimately many individuals often prefer, if not for any other reason than sheer convenience, to paint things as black and white, when the fact is, most things are very grey. READ Imagine Ali Without Dundee, Hearns Without Steward, Hagler Without Petronelli: Can GGG Make It Without Sanchez? In terms of Golovkin vs. Alvarez, the stylistic narrative has been shaped as a classic dichotomy of the puncher vs. the boxer. However, precisely what makes both fighters so effective and dominant is that they both evidence themselves to be a unique boxer puncher blend who have managed to fuse the key components of the two classic styles to create the vaunted destructive forces that they have become. That being said, I champion that Golovkin has the advantage as the puncher, the boxer, and in the all-around intangibles that contribute to his true championship mettle. Canelo may have more twitchy quickness, but that is not the entire definition of boxing. Boxing is an all encompassing term that entails angles, positioning, footwork, timing, judgment, ring generalship, iq, stamina, poise, and even power. But, what appears to be the consensus definition of the word “boxing” is a whole other fallacy that will be addressed in its own article eventually. Both fighters have the capability to box and to brawl. But, it seems in my estimation, that Golovkin has the true championship mettle here, and is simply the superior all around fighter of the two. He is stronger puncher, the sounder boxer, the more fundamental footed, and he will unquestionably be the ring general come Saturday. All of the onus is on Alvarez to try and budge him or befuddle Golovkin in some way to force him to deviate from his gameplan. Fallacy #3: Canelo has fought the better opposition. Canelo has fought the more popular opposition. However, Golovkin has certainly fought the better opposition. Lemieux and Jacobs alone would drill through Angulo, Cotto, Trout, Khan, and Kirkland. At least one or both of them would also likely beat Lara, which Canelo barely did by the way. Furthermore, Martin Murray essentially did defeat Sergio Martinez. And, Mayweather is just an exhibition sparring session sideshow. “Experts” would buttress the argument by saying something to the effect of Canelo’s opponents are of a higher caliber, are future hall of famers, or that they have better pure all-around skills. But, ultimately the object of the game is to win, which makes the key incontrovertible answer to the question “who is the better boxer between fighter A and fighter B”, simply, who would win the match if they fought. Cotto may get to the hall of fame, while Lemieux might not. However, Lemieux would obliterate Cotto in a fisted affair, which makes him the better opponent. Even if the sole reason for the hypothetical dominance of Golovkin’s opponents over Canelo’s is in fact their sheer size advantage, that still doesn’t negate the reality that they are intrinsically more challenging adversaries to have to confront on a regular basis. Therefore, since the majority of Golovkin’s opponents would defeat the majority of Canelo’s opponents, and often by knockout, then it is a sounder argument than otherwise to say that Golovkin has faced better opposition. Fallacy #4: The scant success that Daniel Jacobs had against Golovkin evidences what Canelo will accomplish against him. Daniel Jacobs and Saul Alvarez cannot be two more disparate fighters. And, once again, we’ll start with the size alone. Jacobs possessed a height, reach, and weight advantage against Golovkin, which was the trifecta that encapsulated all of the reason he had any success against Gennady whatsoever. That’s not to discredit Jacobs, as he and any fighter, ought to certainly utilize their physical advantages to their utmost. But, the ability to withstand Golovkin’s punches and keep him at bay had more to do with his physical attributes than his skillset. After all, Golovkin did find Jacobs sans problem, as evidenced by his winning in every column of the compubox ledger. The problem was putting Jacobs away. Canelo will have no such size advantage whatsoever on Saturday, which will serve Golovkin as much mentally as it does physically. Sorry, I just do not see Golovkin capitulating to a smaller opponent. Secondly Jacobs is also a more mobile fighter than Alvarez, which made it hard for the Kazakh to unload his vaunted power punches. Stylistically, Canelo is a pretty sedentary and static specimen. And, that is about as bad a look as you can have when up against a bomber like GGG. Golovkin Stevens and Golovkin Lemieux seem like more accurate depictions of what will probably transpire on Saturday. And, by the way, Alvarez has never even fought a top twenty middleweight, much less an historic one that also happens to be the best one in the world right now. So there’s no telling if he’d even beat the two aforementioned names, amongst others. Previous boxing news: Left-Hook Lounge Mailbag: Chocolatito’s P4P Legacy, Who Has More to Lose Between Canelo/Golovkin, & Adrien Broner’s Legal Troubles! 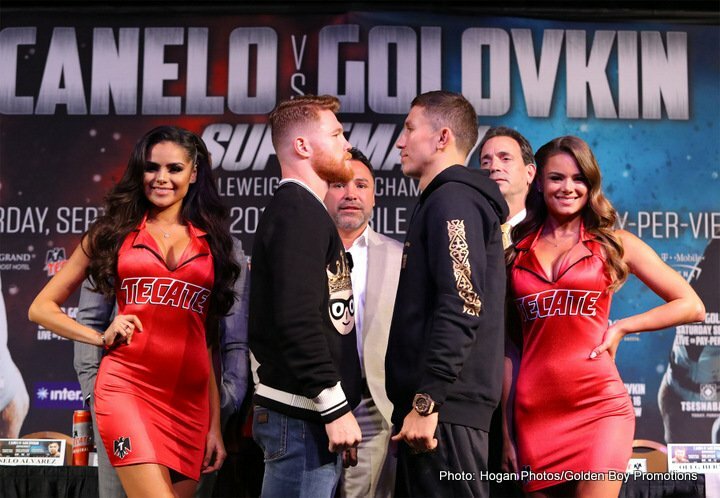 Next boxing news: Can Golovkin – Canelo top even the epic Hagler-Hearns war!